Is this secretive bird a gambler…? 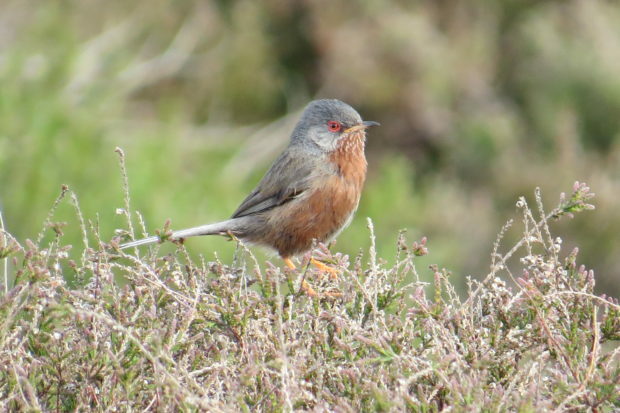 When it’s freezing outside, spare a thought for the Dartford warbler. Unlike birds like nightjars, that migrate to Africa, the Dartford warbler braves the winter here on the Thames Basin Heaths. It’s a risky gamble and sometimes it doesn’t pay off. In very cold winters the population can crash to only a handful of pairs! However, by staying here it saves energy, and also, with many other birds away, there’s less competition for food. To fancy its chances in the worst of winters, it must hunker down in dense gorse bushes for shelter, where it’s believed to share a roost with other birds – a kind of centrally heated dormitory! When you’re out on the heaths, sticking to main paths and keeping your dog close to you is a great way to help. And varying the places you visit will also help keep disturbance to a minimum. Ask a warden for “Greenspace on your doorstep”, your free guide to local walks, or take a look at our online version.